Hey, friends! Ready to kick off a great week? I know I’m feeling determined to make it a good one. Just like I had to make this weekend a good one. Last year my sister and I purchased a Groupon deal for a day tour to 5 North Georgia wineries and planned to go this weekend. Too bad the tour company closed down. No wine. Bummer! I didn’t let myself whine, though. Instead, I did other fabulous things. Like get in a 12 mile frosty run on Saturday morning. At least being greeted by a cheerful note left out as a random act of kindness cheered me up at the end. Despite the run being so cold, it actually felt pretty good. Almost refreshing. At the very least, it made the ice bath following the run not feel like such a drastic temperature change. Oh, who am I kidding? It still stunk. It was only a brief low of the weekend because after that I had a rather important appointment with a testing center. I PASSED!!!! I am now a NASM certified personal trainer!!! I don't know my final score since it just shows pass or fail, but I think I did really well. I 100% knew 100 of the 120 questions. There were only 3 I marked that I was really unsure of. The rest I felt mostly certain, but not 100%. A lot of the questions required applying small details of things I had studied, so it was harder than I anticipated, but overall still good. Although the only detail that matters is - I passed!!! It feels so good to say that after the months of preparation and work to make it final. I finished up the test around 2:30 and hadn’t eaten since breakfast, so the first thing I did was find some food. First place I saw that wasn’t a McDonalds or Arbys? McAlister’s Deli. That’ll do. I did a half and half combo. A Savannah Salad with mixed greens, tomatoes, cucumbers, blue cheese, cranberries, and almonds. As well as a Cobb Club with turkey, avocado, bacon, lettuce, tomato, and a peppercorn sauce of some sort. I originally planned to grab the food to go, but couldn’t wait to eat, so I chose to sit and have a little lunch by myself. I don’t ever typically do that (I’m like Rachel), but it was actually quite nice to have a peaceful solo lunch. I finished just in time to hang out with Peter’s family and watch the UGA vs Auburn game. The rest of the weekend didn’t hold anything too exciting, which was just fine by me. I had the chance to finish my Nicholas Sparks book. If you like his books at all, then you will love this one. It was one of my favorites of his that I have read. Even though his stories aren’t all that original, I find his writing very easy to read and never fail to find myself captivated by the characters. I recommend it. And now, I need some new book recommendations from you all! I’m kind of in the mood for a suspenseful read this time – like my favorite thriller novel Velocity by Dean Koontz. You MUST read that one if you like edge-of-your-seat suspense! It’s good! Alright, enough chit chat. Time for me to hit the gym, then have my very first partent teacher conference for Makenzie. Oh, the excitement! Do you ever like to dine out alone? Any good suspense novels to recommend? Just wanted to say CONGRATS on passing! I have no doubts that you will make an amazing PT! Congrats on the exam! That’s awesome! That game was just embarrassing! 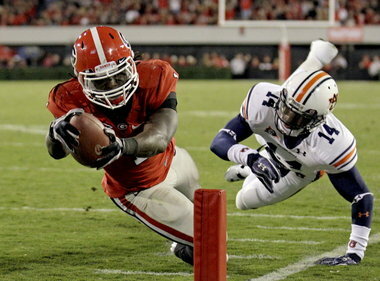 I’m not a huge Auburn fan or anything but deeeeeaaaaaam! LOL! I’m not a huge fan of dining out alone…sort of makes me feel like a loser (NOT saying you are one, that’s just how it makes me feel). I was actually recently sent a great & suspenseful book from the sweetest Keri over at blueeyedrunner.com – Faithful Place by Tana French – I’d definitely recommend it! It’s a murder mystery which takes place in Ireland, so while you’re reading you can mentally give everyone Irish accents! CONGRATULATIONS Tina! Way to go on your test. I, too, am an Nicholas Sparks fan. Actually I hope to start “At First Sight” tonight. Last night I finished Jodi Picult’s “Handle with Care.” Like most of her books this one covers a controversial issue and presents the emotional rollar coaster it can cause families. I read that one and it was one of my favorites of hers. Her books are really good and make you think. YAY! Congratulations on passing! Is that not the most relieving feeling in the world! Awesome lady! I knew you’d pass it! Congrats on passing your test!!! Awesome news. Congrats Tina, so happy for you! That lunch looks really good…I love avacado and I love cranberries in my salad yum! first parent conference – so exciting!! CONGRATULATIONS! I am SO happy for you & know that you are going to help so many people! Oh, wait…you’re already doing that…well, even MORE people! Congrats!!! Great to know there is going to be another fabulous trainer out there to show people how it’s done!! Congratulations girl! That Cert sure makes up for the lost weekend with your sissy! YAy you deserve it! I’m just catching up now, but YEYY! CONGRATULATIONS ON PASSING!! I knew you had it in the bag! Do you have any tips for those of us currently studying? Know how to apply the info. There were a lot of questions with small details that you had to know how to apply versus just knowing what things are. It was honestly a bit harder than I expected, but still doable if you know the material – especially fitness assessments, program design, details of nutrition, etc. I have to tell you again, I am SO proud of you and HAPPY for you!!! Ah, congrats! That must have felt so good to open the letter & see that you passed. EXCITING! 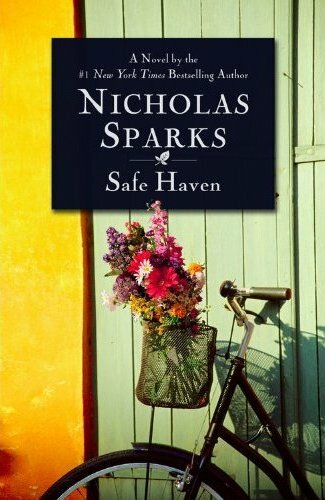 I’ve never read any of the Nicholas Sparks books, but I’d like to start. What are the best ones? Well, The Notebook will always be my favorite! I also really liked A Bend In The Road, The Guardian, and the one in this post. any of them are good, though. I know I’m a little behind this week, but CONGRATULATIONS, TINA!!! How exciting! You’ll be an amazing trainer. Late to the party but still wanted to drop in and say CONGRATS!! Not that I had any doubts. I like that they don’t tell you your mark. I had clients ask me what I scored on mine! I just finished an awesome book – though it’s not a thriller/suspense. Jennifer Weiner’s Then Came You was so wonderful. It’s about surrogacy and all of the different people involved and their stories. It was really really good. Definitely not Dean Koontz. If you’re looking for thriller/suspense, I love David Baldacci, particularly the Sean King/Michelle Maxwell series. Very good stuff! Oh, and CONGRATS on passing your exam!!! Forgot to mention that above! !